Foaled on February 11, 2011, Mecca’s Angel was a daughter of Dark Angel, a leading sire of sprinters, out of a mare by Atraf, another high-class sprinter, so was always destined to campaign over short distances. Indeed, between May 2013 and October 2016, Mecca’s Angel ran in a total of twenty races, all bar three of them over the minimum distance of 5 furlongs and the others over 5½ and 6 furlongs. All in all, she won ten times, including the Group Three World Trophy at Newbury, Group Three Prix de Saint-Georges at Longchamp, Group Two Sapphire Stakes at the Curragh and, most notably, successive renewals of the Group One Nunthorpe Stakes at York, in 2015 and 2016. All of her wins came over 5 furlongs and she amassed just shy of £680,000 in win and place prize money. Owned by David “Mecca” Metcalfe and trained by Michael Dods in Denton, Co. Durham, Mecca’s Angel made a bright start to her career, winning her maiden at Hamilton in June, 2013, at the second time of asking, and following up, by 12 lengths, in a minor handicap on the Fibresand surface at Southwell just over two weeks later. 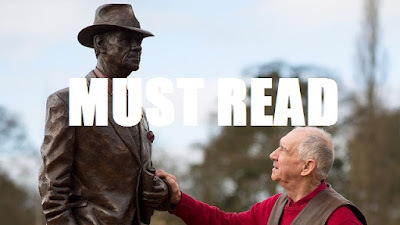 Raised 17lb in the weights for her Southwell romp, she was subsequently beaten favourite, although second on both occasions, in the Julia Graves Roses Stakes at York and Blah Blah Stakes at Haydock, before finishing fourth of 23 in the Two-Year-Old-Trophy at Redcar on her first attempt over 6 furlongs. On her first two starts as a three-year-old, Mecca’s Angel was the impressive winner of handicaps at Thirsk and Hamilton, prompting a further 10lb rise in the weights, before being raised in class and distance for the Prix Texanita at Longchamp in May. She was a beaten favourite, once again, in the latter contest but, after four months off, returned to record her first Listed and Pattern race successes at Doncaster and Newbury, respectively. Her four-year-old campaign was restricted to just three starts, of which the highlight was, unquestionably, her 2-length defeat of Queen Mary Stakes winner, Acapulco, who was receiving 24lb, on her first attempt in Group One company in the Nunthorpe Stakes at York. Indeed, that effort was only bettered by her performance in the same race the following year, in which she not only beat the July Cup winner Limato by 2 lengths but came within a whisker of breaking the course record set by Dayjur – once dubbed ‘the fastest horse in the world’ by the Racing Post – in 1990. The following October, Mecca’s Angel started 6/4 favourite for the Prix de l’Abbaye de Longchamp but, having taken the lead inside the final two furlongs, weakened close home to finish third, beaten just three-quarters of a length, behind Marsha. 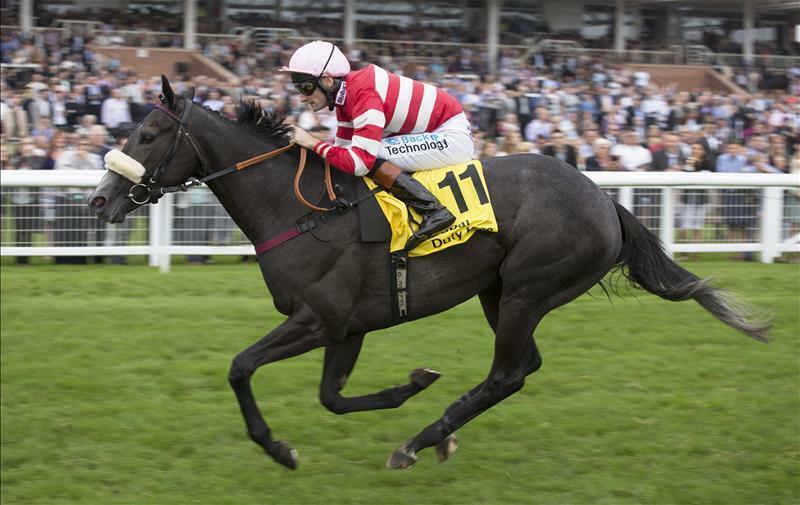 Following her final race, the British Champions Sprint at Ascot in October 2016, in which she finished only twelfth of thirteen, beaten 12 lengths, behind The Tin Man, Mecca’s Angel was retired from racing and subsequently sold, privately, for an undisclosed fee. The Nunthorpe Stakes, a Group One race run over five furlongs at York, is one of just two races of its kind in the British racing calendar. Group One races rarely produce winners at huge odds but, since 2010, the winner of the Nunthorpe Stakes has been returned at 40/1 (twice) and 100/1. The perfectly flat five-furlong course at York – the course record is just 2.47 seconds outside the world record for the minimum distance – invariably produces a fast and furious contest, in which missing the break is not an option, which may account, at least in part, for the frequency of ‘shock’ winners in recent year. 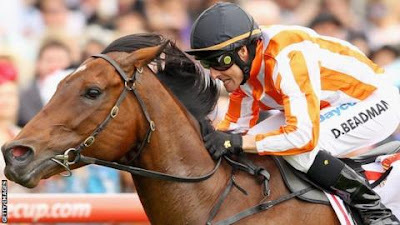 In any event, one major upset came in 2013, courtesy of Jwala, a hitherto unheralded four-year-old mare, who was making her debut at Group One level. Bred and owned, in part, by Manor Farm Stud, in Oakham, Rutland, Jwala was trained by Robert Cowell, at Bottishead Stud in Six Mile Bottom, near Newmarket, Suffolk. In her early days, Jwala was a fair, if unspectacular, sprinter. She comfortably won her maiden, over 5 furlongs, at Wolverhampton in December, 2011, at the fifth time of asking and, after a 198-day break, subsequently won handicaps at Bath and Goodwood on her first two starts as a three-year-old. Jwala was restricted to just three starts in 2012, but in September that year made her debut in Listed company, finishing second, beaten 1½ lengths, behind Sole Power in the Scarborough Stakes at Doncaster. 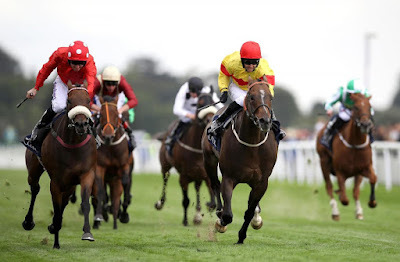 Notwithstanding finishing last of seven in a minor conditions stakes race at Chester, in which she was drawn on the wide outside, Jwala continued to run creditably in defeat in Listed company in the early part of 2013. 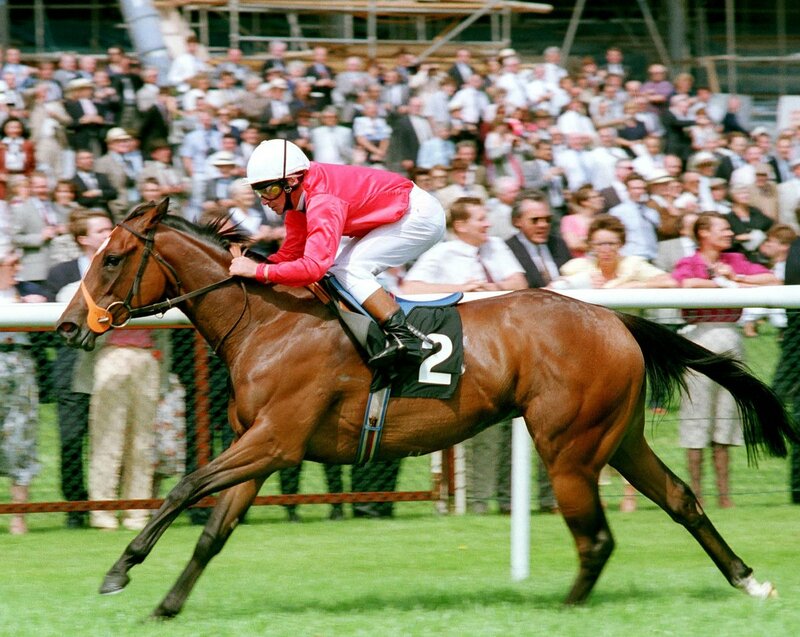 She didn’t win again until July when, perhaps tellingly, she led near the finish to beat Heeraat by a neck in the City Walls Stakes, over the same course and distance as the Nunthorpe Stakes. 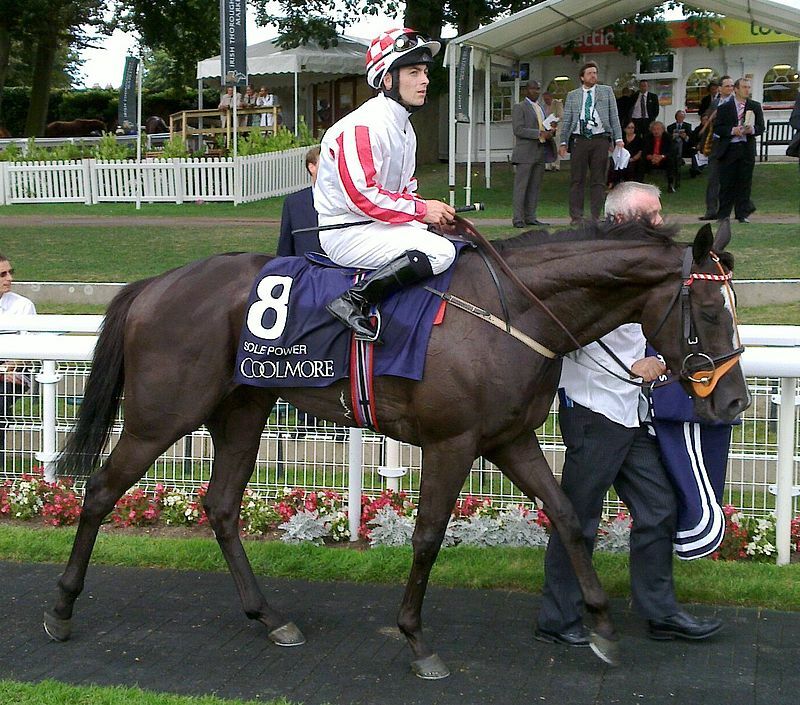 On her next start, the following month, Jwala made her debut at Pattern level, in the Group Two King George Stakes at Goodwood. A largely unconsidered 20/1 chance in any case, she fractured an eye socket leaving the stalls and, unsurprisingly, faded inside the final furlong to finish last of the seventeen runners, beaten 10 lengths. Undaunted, three weeks later, connections stepped her up in class again for the Nunthorpe Stakes, for which she was sent off only joint-thirteenth choice of the seventeen runners at 40/1. However, on ground softened by just short of three-quarters of an inch of rainfall overnight, Jwala was in her element. Under a well-judged ride by jockey Steve Drowne, she was always in the front rank and, when sent for home entering the final furlong, never looked like being caught. Market leaders Shea Shea and Sole Power both finished strongly, but Jwala held on well in the closing stages to win by half a length and a nose. In so doing, she provided a welcome fillip for Drowne, who had missed most of the previous season after suffering what was originally described as an ‘undiagnosed seizure’ – subsequently diagnosed as a heart virus – which led to the withdrawal of his driving licence, without which he could not be insured to ride. Jwala proved her Nunthorpe Stakes win was no fluke by finishing fourth, beaten just 1¾ lengths, in the Group One Prix de l’Abbaye de Longchamp in October, but her story did not end happily. In December, on what was intended to be her final start before retirement, she contested the Hong Kong Sprint, over 6 furlongs, at Sha Tin. She was weakening when squeezed out between rivals and falling, fatally, in the closing stages. Steve Drowne was carried from the course on a stretcher and hospitalised with a fractured collarbone and a punctured lung. 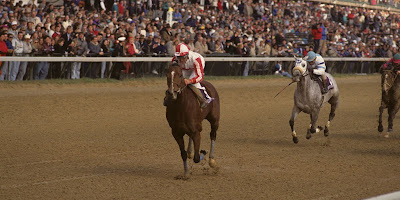 Embed from Getty Images Foaled in Ireland on February 13, 1998, Mozart was sired Ladbroke Sprint Cup winner Danehill out of Victoria Cross, an unraced half-sister to Kentucky Derby winner Sea Hero. Owned by Mrs. Susan Magnier and Michael Tabor and trained by Aidan O’Brien at Ballydoyle Racing Stable in Cashel, Co. Tipperary, Ireland, Mozart made his racecourse debut in a minor maiden race, over 7 furlongs, at the Curragh in July, 2000. Sent off at prohibitive odds, of 2/9, he was pushed clear by Seamie Heffernan in the final quarter of a mile and stayed on strongly to win, easily, by 8 lengths. Following an 86-day break, Mozart was stepped up in class in the £400000 Tattersalls Houghton Sales Stakes, again over 7 furlongs, on the Rowley Mile Course at Newmarket in September. Despite facing 25 rivals, he again started favourite, at 11/10, and, although his task was made easier by the second favourite, Eminence, refusing to race, Mozart took the overall lead inside the final furlong and held on well, under Mick Kinane, to win by a length. The following month, Mozart was stepped up in class again in the Dewhurst Stakes over the same course and distance but, having held every chance with two furlongs to run, weakened in the final hundred yards to finish fourth, beaten 2 lengths, behind comfortable winner Tobougg. Mozart reappeared in the 2,000 Guineas Trial Stakes, over a mile, at Leopardstown in April, 2001, but finished only third of five, beaten 3¼ lengths, at odds of 1/4. He was again beaten, albeit narrowly, at odds-on in the Tetrarch Stakes, back over 7 furlongs, at the Curragh the following month, before taking his chance in the Irish 2,000 Guineas, over a mile, at the Co. Kildare track three weeks later. Despite carrying the third colours of owner Michael Tabor, Mozart belied odds of 20/1 by finishing second, although he was easily brushed aside by his equally unfancied stable companion, Black Minnaloushe, in the closing stages. Consequently, Mozart started favourite, at 7/4, for the Jersey Stakes, back over 7 furlongs, at Royal Ascot. Reunited with Mick Kinane, he made most of the running and, despite being hard ridden, held on well close home to beat the strong-finishing Alderbaran by a neck and record his first success at Pattern level. However, it was on his next start, when tried over 6 furlongs for the first time, and pitted against specialist sprinters at the highest level, in the July Cup at Newmarket that Mozart proved something of a revelation. 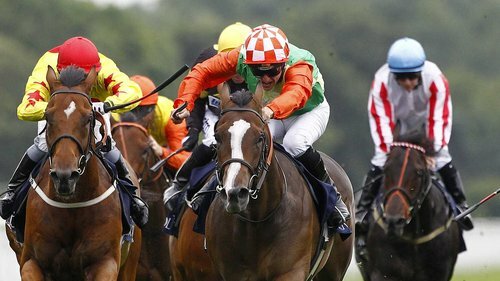 Sent off favourite again, at 4/1, he made all on the stands’ side and was ridden clear in the final furlong to beat King’s Stand Stakes winner Cassandra Go decisively, by 3½ lengths, with Sprint Stakes winner Misraah a further length behind in third place. On-course going officially described as ‘good’, the winning time, of 69.86 seconds, was only three-tenths of a second slower than the record set by Stravinsky, also trained by O’Brien and ridden by Kinane, two years earlier. After such a devastating demonstration of speed, O’Brien had no qualms about letting Mozart take his chance in the Nunthorpe Stakes, over 5 furlongs, at York the following month. 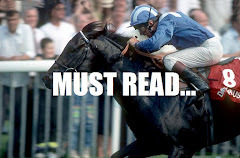 In fact, shortly after the July Cup he simply said, ‘If we run in that [the Nunthorpe Stakes] we would have to let him go a bit earlier, that’s all.’ It appears that the betting public took the Master of Ballydoyle at his work because, on the Knavesmire, Mozart started 4/9 favourite and never gave his supporters an anxious moment, taking the lead just after halfway and running on strongly to beat subsequent Haydock Sprint Cup winner Nuclear Debate by 2 lengths. 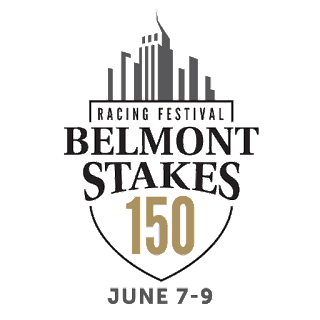 Sent to Belmont Park in Elmont, New York for the Breeders’ Cup Sprint, back over 6 furlongs, in October, Mozart missed the break and was never involved, eventually finishing eleventh of 14, beaten 10 lengths, behind Squirtle Squirt. Nevertheless, his two domestic Group One victories resulted in Mozart being named Cartier Champion Sprinter of 2001. Foaled in Ireland on March 16, 2013, Marsha was a daughter of high-class multiple winning sprinter Acclamation but, unlike some of his more precocious progeny, didn’t see a racecourse until the September of her two-year-old season. Bred and owned by the Elite Racing Club, in whose familiar colours – black cap, white jacket with three large black spots – she raced and trained by Sir Mark Prescott at Heath House Stables in Newmarket, Suffolk, Marsha made her racecourse debut in a maiden stakes race, over 6 furlongs, at Kempton. 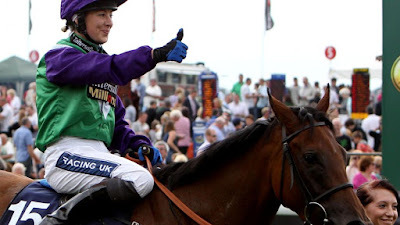 Ridden by stable jockey Luke Morris, who would partner her to all her major successes, Marsha took a keen hold and kept on to finish second, beaten a length, behind Zhui Feng, who won the £200,000 Tattersalls Millions Median Auction Trophy at Newmarket on his next start. Just over two weeks later, though, Marsha readily won her maiden, over 6 furlongs, at Catterick and comfortably followed up in a small European Breeders’ Fund confined race, over 5 furlongs, at Dundalk, under Declan McDonogh, three weeks later. Two weeks later, she took on older horses in the Mercury Stakes, over the same course and distance but, having been short of room around the first bend, could only keep on to finish third, beaten 2¾ lengths, behind Take Cover. After a 204-day break, Marsha was beaten on her first two starts as a three-year-old, both over 6 furlongs, in a 0-105 handicap at Newmarket and the Group Three Ballyogan Stakes at the Curragh. However, thereafter, she was campaigned exclusively over the minimum trip and began to show the consistent, high-level form that would eventually see her fetch 6 million guineas (£6.3 million) – a European public auction record – at Tattersalls December Mare Sale at the end of her racing career. Marsha opened her account for the season with a facile victory in the Land O’Burns Fillies’ Stakes at Ayr, quickening clear on the bit in the closing stages to win readily by 2½ lengths. She followed up in the City Walls Stakes at York, beating Scurry Stakes winner Easton Angel by a neck, and consequently started 5/1 joint-favourite for the King George Stakes at Goodwood three weeks later. In the latter contest, she took keen hold in the early stages and, although staying on strongly in the final hundred yards, couldn’t quite reach the leaders and came off worst in a five-way photograph, beaten a neck, a head, a short head and a head. Nevertheless, after a six-week break, she was made an outright favourite, at 2/1, for the Prix du Petit Couvert at Chantilly. She finished a creditable second, but could never lay a glove on Just Glamorous, who made all the running to win, unchallenged, by 3 lengths. 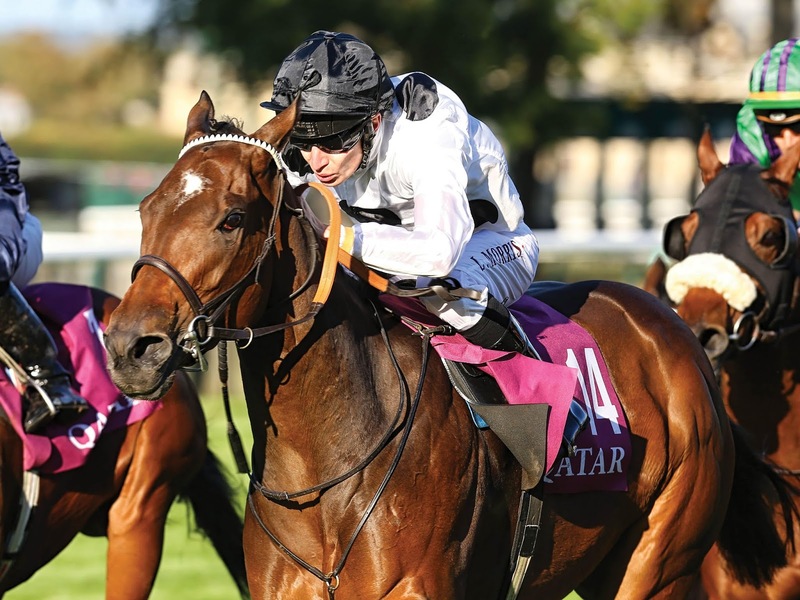 The following month, though, Marsha returned to Chantilly for her first attempt at Group One level, the Prix de l’Abbaye de Longchamp, run at northern French track during the redevelopment of Longchamp Racecourse. Sent off a just seventh choice of the 17 runners, at 16/1, behind the dual Nunthorpe Stakes winner, Mecca’s Angel, who headed the market at 6/4, Marsha tackled the favourite in the last 75 yards and was driven out by Luke Morris to win by three-quarters of a length. Washington DC finished second, with Mecca’s Angel a further short-head away in third place. On her reappearance the following May, Marsha beat Washington DC again, this time by a neck, in the Palace House Stakes at Newmarket. She subsequently ran respectably in defeat in the King’s Stand Stakes at Royal Ascot, won by Lady Aurelia, the Sapphire Stakes at the Curragh, won by Caspian Prince, and the King George Stakes at Goodwood, won by Battaash, before crossing swords with Lady Aurelia again in the Nunthorpe Stakes at York. Having her first race since Royal Ascot, and hitherto unbeaten over the minimum trip, Lady Aurelia unsurprisingly started odds-on, at 10/11, with Marsha joint-third favourite of the 13 runners at 8/1. Lady Aurelia broke quickly and, along with Take Cover, to the field along in the centre of the course, while Marsha tracked the leaders on the stands’ side. As Take Cover weakened approaching the furlong marker, Marsha set off in pursuit of the leader and, despite edging left in the closing stages, led on the line to win by a nose. Here at sprinters to go, we are all about speed. 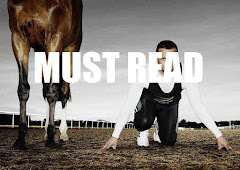 For the most part, this blog is dedicated to thoroughbred sprint horses - specifically the Nunthorpe Stakes, which is run over the flying five furlongs at York's Knavesmire. The fastest horse to win this Group 1 race was Borderlescott, trained by Robin Bastiman. He won in a time of 56:09s. As the saying goes: ''speed is relative''. Linford Christie, UK Olympic sprint champion in 1992, was fast but compared to Borderlescott - even over 100 metres - he was pretty damn ''slow''. Let's consider the Grand National. 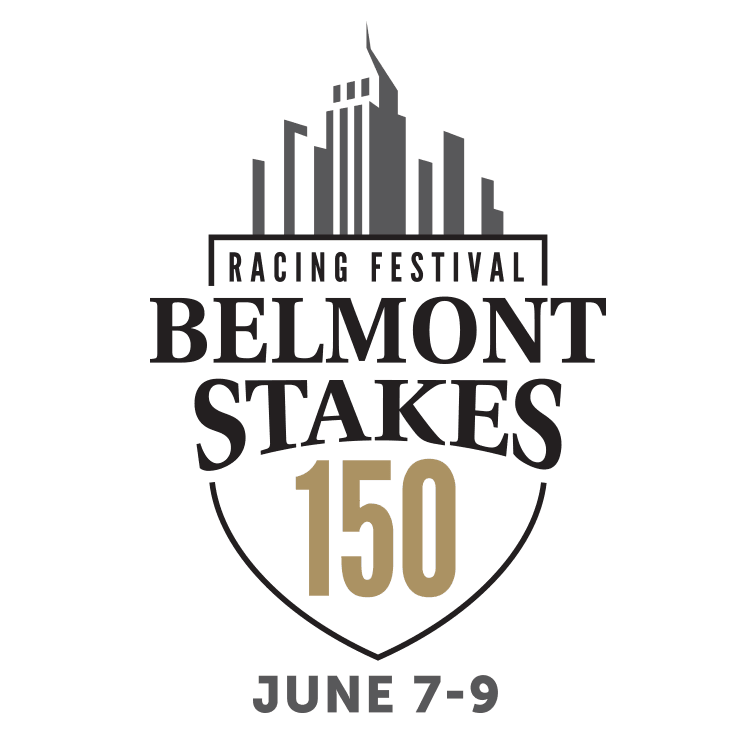 Not a race for sprint horses. It's a four-mile three-and-a-half furlong slog. The great sprinter Dayjur struggles with jumping shadows so heaven knows what he would have thought about a ten-foot fence in his path with Captain Becher pocking his head over the top smiling like a Cheshire cat. But even in the slowest, toughest, hardest races, there is one horse who, although slow, is fast as a snake down a hole, when it comes to the Grand National Steeplechase. If you are horse racing quizzer you will know the answer to this question in the time it takes to say: ''National Sweepstake''. The appropriately named Mr Frisk achieved a record-breaking time in the national back in 1990. Trained by Kim Bailey, ridden by Marcus Armytage, he finished in 8m 47.8s. That record has stood the test of time even though in 2013 the distance of the race was shortened by over 300 metres. Many punters returned home with cash-laden pockets after the 16/1 shot. However, it was a fight to the line as Durham Addition lost by just three-quarters of a length, some twenty lengths clear of the third, Rinus. Mr Frisk, a son of Bivouac out of the mare Jenny Frisk was a popular horse after achieving this honoured mantle trumping the likes of Red Rum. This fast chestnut gelding pulled up when competing for the next year on good to soft going. That was a telling point. In 1990, the ground was firm, which even in the good old days where health and safety sat somewhere at the back of the grandstand, it wasn't the norm. 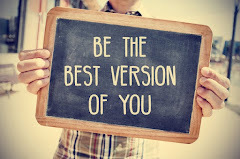 Many pundits have reflected upon his record as a matter of circumstance as it was talent. In these modern days, it would seem unlikely a horse will ever threaten the time of Mr Frisk. The going conditions and routine watering of courses to make them safe means firm ground on the national course simply couldn't happen in this modern era. Mr Frisk, the winner of nine of his twenty-five National Hunt races, is odds-on to remain the fast of them all. 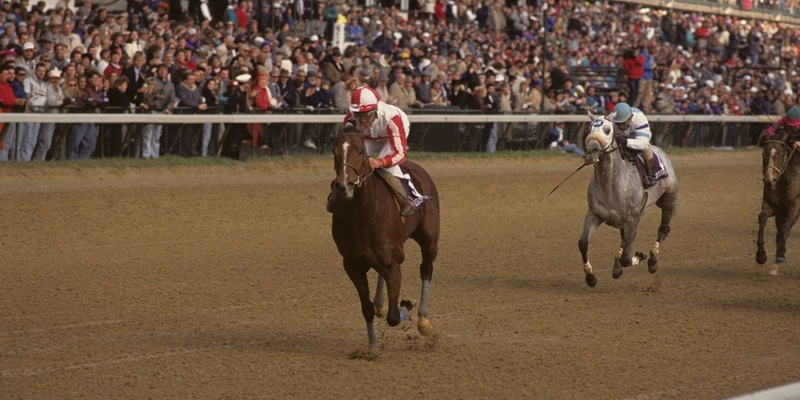 Embed from Getty Images Foaled in Kentucky on March 3, 1995, Bahamian Pirate was a son of Housebuster, who won the Eclipse Award for Male Sprinter in 1990 and 1991, and is the horse for whom his sire is best known in Europe. Owned by Lucayan Stud, under the auspices of the late Edward St. George, in whose famous black-and-white colours he ran, Bahamian Pirate began his racing career, as a three-year-old, with the late Con Collins at Conyngham Lodge Stables in Maddenstown, Co. Kildare, Ireland. However, after two unplaced runs, over 7 furlongs and a mile, Bahamian Pirate was transferred to the late David ‘Dandy’ Nicholls, a.k.a. ‘The Sprint King’, at Tall Trees Farm in Sessay, near Thirsk, North Yorkshire. Even so, it was over a year, and half a dozen runs, later that Bahamian Pirate broke his duck, making virtually all to win a maiden stakes race, over 5 furlongs, at Ripon under Nicholls’ wife, Alex Greaves, despite hanging right from halfway. Bahamian Pirate wasn’t seen again until May, 2000 and, although finishing only twelfth of 24, beaten 6¼ lengths, on his handicap debut, over 5 furlongs, at Thirsk, apprentice Clare Roche was suspended for eight days for making ‘insufficient effort’. Six days later, under Nicholls’ son, Adrian – at that time, himself still an apprentice – Bahamian Pirate won a lower grade handicap, over 6 furlongs, at Carlisle. Indeed, that year proved to be the most successful, numerically, of his career, with four more wins, including the Ayr Gold Cup and the Bentinck Stakes at Newmarket. Thereafter, though, Bahamian Pirate was campaigned almost exclusively in Listed and Pattern company for the next three seasons and, while he suffered a few agonising ‘near misses’ – he was second in the Prix de l’Abbaye de Longchamp in 2001 and second in the July Cup, behind stable companion Continent, in 2002 – he won just one race in that period. His sole success came, by a short head, in the Phoenix Sprint Stakes, over 6 furlongs, at Leopardstown in August, 2001, and was followed by a 26-race losing streak that would last until he made his seasonal debut, as a nine-year-old, in March 2004. Nevertheless, on his return from a 178-day break, Bahamian Pirate demonstrated his well-being by winning a small conditions race – in which he was, very much, favoured by the race conditions – over 5 furlongs at Nottingham. He again failed to make impression in Listed and Pattern company, but did win two more small conditions races, both over 5 furlongs, at Beverley and Newmarket, in May and July, respectively. In fact, on the latter occasion, he beat the 115-rated three-year-old, Balmont, who’d finished third in the July Cup on his previous outing, to whom he was conceding 8lb. The pair met again in the Nunthorpe Stakes at York but, despite being 6lb worse off for the neck he finished behind Bahamian Pirate at Newmarket, Balmont remained the better fancied, at 13/2 joint-fourth favourite, with Nicholls’ veteran only eighth choice of the twelve runners at 16/1. Nevertheless, in the hands of Seb Sanders, who was riding him for the first time, Bahamian Pirate stayed on well to lead inside the final furlong and was driven out to win by a neck from The Tatling with the strong-finishing favourite, One Cool Cat, a further length away in third place. In so doing, he not only provided Nicholls with his second win in the Nunthorpe Stakes – after Ya Malak dead-heated with Coastal Bluff in 1997 – but became the oldest winner of a Group One race in Britain.